I hooked up my AM/FM radio as another audio source. I would use the local station’s broadcast of music as a feed into my broadcast (to tape of course). I would just turn up the volume of the radio and about 90% of the time music was playing. If the DJ was on I would just stop the tape, rewind and start over. Then I would fade the music out (radio volume down) and start my DJ act. It was a lot of fun. Eventually I had two friends over. The three of us put on a show. I was the DJ, Danny was news, and Jason was sports. I would play the music then introduce Danny or Jason and hit the switch to turn on their microphone and feed it’s audio to the tape recorder. So here I am many years later. As part of my personal entertainment I watch, or listen to a couple of Internet only shows. Alison Rosen Is Your New Best Friend, a ustream.tv show and audio only show put on by Olivia Wilder via blogtalkradio.com. Both are very fun, and besides the obvious talent of these two ladies being able to interact with them in their respective chat rooms the entertainment experience just that much more amazing. I have a successful website, xjTalk (xj is the two letter designator assigned to the Cherokee model by Jeep) and thinking about all the fun I have having being an interactive viewer/listener of these shows I thought that my Jeep friends (and xjTalk website members) might enjoy a talk show about Jeeps. About 6 months ago I started looking into the various pieces of software and audio equipment I would need. 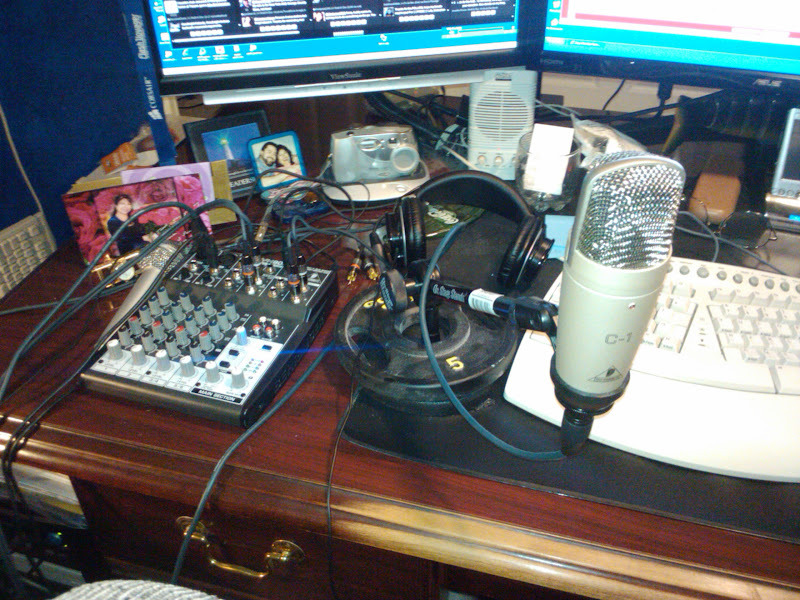 I recently purchased a very inexpensive mixer, microphone, stand and connected it all to my computer’s audio interface. I have found that with a minimal investment I am able to record “shows” and create a podcast for either streaming or download, plus I am able to broadcast live on ustream.tv. I have done two one hours “test” shows, and my first real show is tomorrow night. Playing around with technology that is light years ahead of what I was using when I was 12 to 14 is just amazing. As a tech guy I understand it and know how we got to this point in the level of technology, however as the kid in me looks at it I am awe struck. So I have come full circle, from a child with a sound recorder to a computer with the ability to act as a sound recorder, however now instead of being able to broadcast my “show” to an audience of my Mom, Dad, or visiting friend I have the ability to broadcast to a world wide audience, and all for the cost of a computer, a hand full of audio equipment, and a moderate amount of scratch for the Internet access. Now if I was just one of a very few that had the ability to do this, my station would be worth millions and shows heard by as many. However with the price so low and technology so prevalent I’m just one of thousands and my show may be heard by hundreds if I am lucky. That’s okay, because compared to the tape recorder that is a major jump in my audience! I am considering doing a podcast for this site, which would be a general rant about crap, much like my posts are. I don’t know maybe I just like hearing myself talk a little too much. You can follow, or friend Alison Rosen or Olivia Wilder to get show updates, dates and times via Twitter and/or Facebook. That was the good thing about the old days, when you could get creative with every day electronic devices. nnThe first “multi-track recording” I ever did was on a Sears stereo! It had a turntable, cassette, 8-track, and radio, and all these extra ins and outs in the back. It also had right and left mic inputs in front. What I did was first I recorded the drums through the cassette’s left input, then I simultaneously fed that into one side of the 8 track while I recorded bass onto the other, then I spliced radio shack wires together so that both outputs from the 8 track went into one side of the cassette while I recorded vocal and guitar onto the other! nnI wonder if I still have any of those recordings… It was like the old “fake” stereo records, with drums and bass on one side and the guitar and vocal on the other. That was so much fun. You feel like genius! The think that got to me about doing that was just how really easy things are. You hear, or see people do amazing things but it isn’t really that hard to understand how. I learned later the hard part is doing it everyday with consistency.